Giro d'Italia Route Map. Click for a video fly through of the 2009 Giro d'Italia race route in Italy. 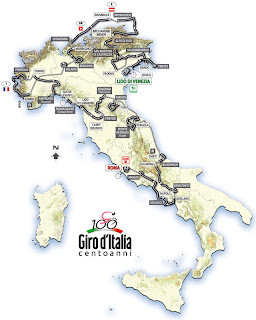 Giro d'Italia 2009 is 21 stages and 2 rest days from May 9, 2009 - May 31, 2009. Giro d'Italia 2009 teams should be announced in late January/ early February. Rosters will be announced in April. For more about Italy visit http://www.WebvisionItaly.com, the only TV network about Italy in English.